To Melpomene, as the muse of the tragic descent and the nightmare of addiction, I now give dominion over the adornment and engineering of drug paraphernalia; the detailing of the LSD blotter; the spidery small microcosmic worlds of the speed freak, lathering up a fever at four in the morning at All Star donuts, unable to eat but unable to move, pens laid out in neat rectangles; the shiny polished chrome of the espresso machine; the long lathed ivory cigarette holder and its companion death's head Zippo lighter; the carved meerschaum pipe direct from Turkey with resin screen but (if sold in California) please only for tobacco. But I reserve for the one of many hymns, the muse of the sacred song, the beautification of musical instruments, a sacred musical task if there ever were, sweet lovely but most serious Polyhymnia, a finger held to her mouth to keep us quiet as we look upon the adornment with awe. Oft-blogged Amy Crehore's very beautiful and hopefully first-in-a-series Tickler ukelele is above. Ooooh I want it. 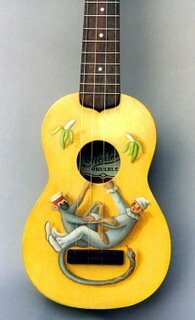 I just discovered that my son Duncan can play most all of the Hank Williams catalog and proved it to me at my mother's home using the same plastic-necked department store uke on which I first learned to play Little Brown Jug. 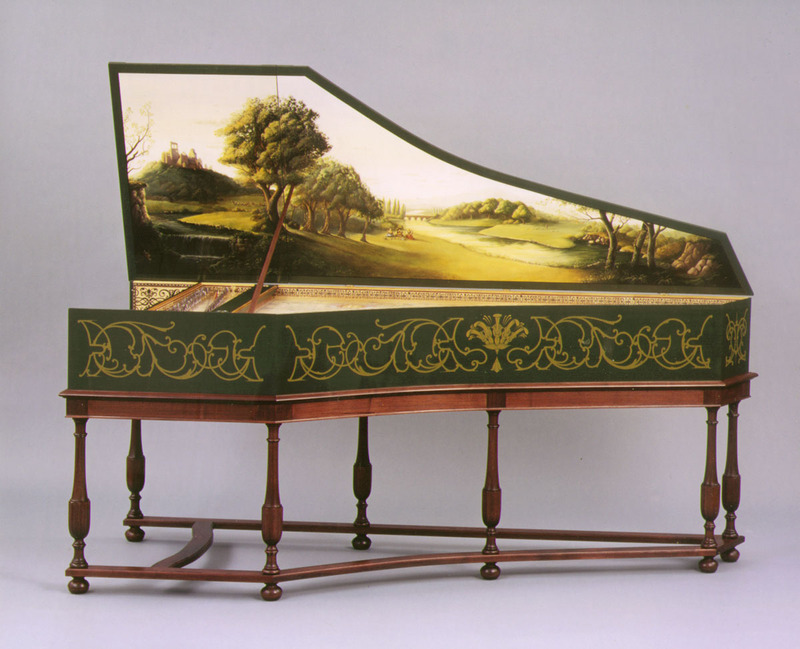 And my favorite of Adrian Card's harpsichords is below. I want that too. 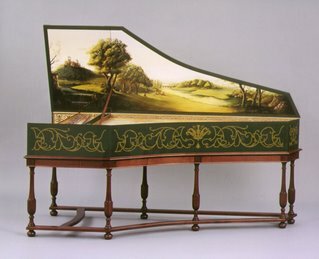 I can't play the harpsichord so well and they are surprisingly quiet for those of us raised on 'lectric guitars and synthesizers but lovely as a dream when played well.